Another easy care species tulip. 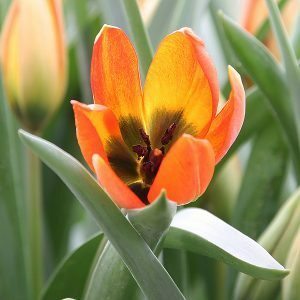 Tulipa whittallii with its coppery orange flowers is a reliable performer in our garden. What it lacks in scent, it makes up for in its natural informal elegance. Originally from south western Turkey, and flowering for us in early to mid spring, the flowers have a green tinge to the base, the petals are often flushed with red. As the flowers open, the base of each petal is seen to blotched with near black. It will reach around 20 – 25cm in height and grows well in well drained humus rich soil. Best in full sun, with perhaps some shade in the afternoon, especially in summer. The bulbs are best planted at around 8cm deep, although this is bulb that may pull itself a little deeper depending on soil and climate. Top dress each year in autumn ti winter with some blood and bone and a little well rotted compost. We use a pelletised seaweed fertiliser in spring after flowering. You do not need to lift this bulb every year if you have a reasonably cool winter. Over time it will form a good sized clump. And every 4 – 5 years the clump can be divided if desired. The time to divide is in autumn.